The most memorable conversations are often those that were unexpected. So it follows that in order to create something memorable, we have to cultivate the unexpected. 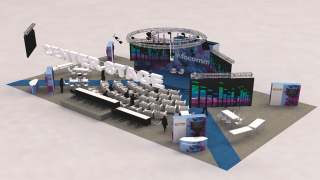 That’s the ethos behind the programming that I’ve been helping InfoComm to develop for its brand-new Center Stage series, which will debut at the show in Orlando this June 14-16. These will be three days packed with unanticipated conversations between the foremost thinkers and doers in and around AV. The program is packed with experts from the audiovisual periphery, the ones who employ technologies and environmental design strategies at the most captivating edge of their use cases. They will be joined in dialogue by those who analyze and connect these technologies to the work done in our field, and the resulting conversations will illuminate the many ways our industry’s work can produce valuable outcomes. 10:00a.m. : Nevin Steinberg, the sound designer for a little Broadway production called Hamilton, will discuss how “Your Brain Does it Better: The delicate art of using sound and video immersion in live event design,” in a dialogue with Daniel Brodie, projection designer for another Tony award-winner, Disney’s Aladdin. 1:30 p.m.: Motorsport fans (myself most fervently among them) will flock to “The Race to Engage: How Daytona's upgrade is driving returns for fans and brand partners,” a dialogue between Rodney Ward, senior director of venue technology with International Speedway Corporation and Brian McClimans, VP global business development for Peerless-AV. 3:30 p.m.: When Kipp Bradford from the MIT Media Lab does his session, “It’s Not Just Noise: How Electronic Music and Virtual Reality Will Change the Future of Computer Programming,” he’ll provide a glimpse of how programming language and tools are evolving with input from creative users. 2:00 p.m.: You’re going to want to make sure your departure is later on Friday this year, because we are closing Center Stage with a finale hosted by Brian Dickson, director of video production for No Static. Talk to Dickson for just five minutes, and you will hear about every new possible angle on live video production, VR capture, streaming, and the extremely creative integration of all of the above. He doesn’t just see gear, he sees the reconfiguration of gear to solve the biggest problems that used to get in the way of truly immersive visual experiences. This will be a live demo session where audience participation is encouraged, and we’ll be bringing in a variety of video world notables to collaborate with him on stage. That sounds like a lot, but those are just the highlights from a very full program. Watch this space for part two of the Center Stage preview and more details to come.